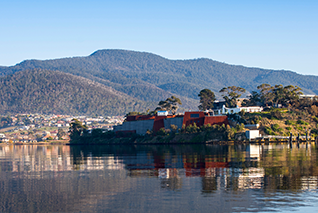 You’re in Hobart so you want to go to big things, the icons; MONA (the Museum of Old and New Art), Mount Wellington, and you’re a mountain biker so you always want to do what a mountain biker does. You’ve only got a day, how do you fit it all in? 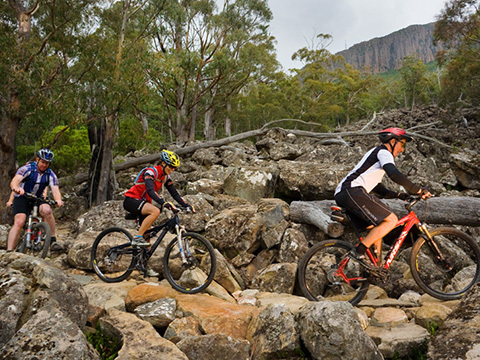 Let us take you up Mt Wellington to enjoy the majestic views, put you on a bike and ride the famous North South Track. Then spend the afternoon at Walshy’s place, MONA before catching the Ferry back to the centre of Hobart. Can a day get any better? Maybe, book the Posh Pit option on the ferry home and Walshy ‘ll throw in a beer and a bit of cheese as you cruise back to town 1st class. We drive from Hobart city to the summit of Mt Wellington in our bus, The Sir David (yes, we did name it after MONA's founder, David Walsh. And our trailer is called the Leigh C, after the director of MONA’S Dark MOFA festival). At 1300m above the city the views are breathtaking ( the weather usually is too ). You can easily spend a day or a lifetime up here but we’ve got a lot to do today so we have to crack the whip and limit it to 15 minutes. Oohh and Aahh, take a photo and GET BACK ON THE BUS! We put you on a bike and and your guide will lead you down the famous North South track as it winds it way the Mountain. The end of the North South track is only a few kilometres from MONA so we keep riding and arrive in style at MONA. Enjoy the grounds, the culture the bar and the Museum and then catch the ferry back to the city. What a great day! WHAT’S INCLUDED IN THE MOUNTAIN TO MONA? If you book, you’ll ride. We don’t do minimum numbers. I don’t care if no one but you turns up and I lose more money than a drunken sailor in a get rich scheme. If you book, you’ll ride. OK there are some safety issues concerning dangerous conditions but within reason if you book a tour with us you can be confident that your riding - even if it's just you and me. Please Note: MONA is quite popular and in peak season can get booked out. I'm not on first name terms with David Walsh and I can’t pull the old “Don’t you know who i am”. If MONA is booked out we can still take you there. You can enjoy the grounds and the bar but we can’t jump the queue and get you into the museum. If this happens we will contact you prior to departure.